Video Games as Literacy Tools? Great news! On September 19th and 20th, the library will have a free book giveaway in our Community Room downstairs. Tons to pick from! Made possible by a generous donation from the Christian Appalachian Project. Librarians have promoted the virtues of reading since the dawn of libraries, but researchers have been studying literacy skills developed from other sources than just books. Many modern video games require the player to read large blocks of text to advance the storyline of the game, and researchers are finding that these reading requirements translate over to real reading skills. For more on this research, check out the article at Perspectives In Reading. 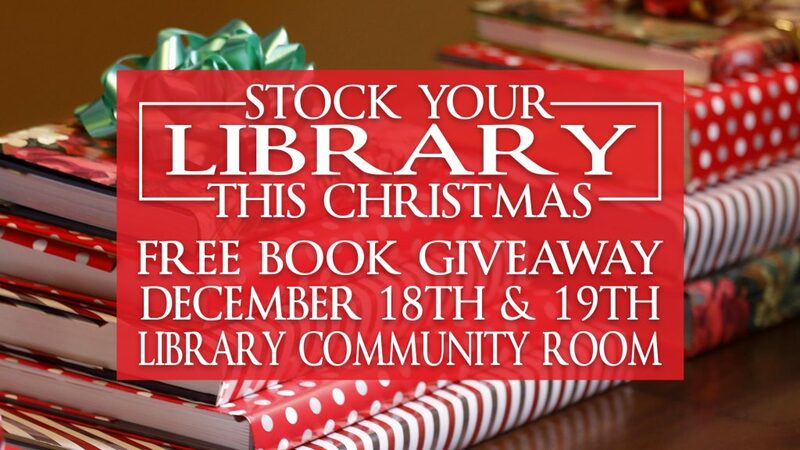 We will be hosting a free book giveaway in the Community Room on December 18th and 19th. Drop in and restock your library with some new titles, or find a gift to give the reader in your life for Christmas. Lots of books for readers young and old! Santa Claus is dropping by the library on December 13th for free pictures from 5-8pm. Use your own camera to take pictures or allow local photographer Kevin Hays to take them for you. Pictures will be posted to an album on our Facebook page where you can grab them to download and print out. Great news! On September 19th and 20th, the library will have a free book giveaway in our Community Room downstairs. Tons to pick from! Made possible by a generous donation from the Christian Appalachian Project. When you happen across a new word, sometimes you can guess what it means just by the way that it sounds. Other words are far trickier and unusual. The theme for this Friday’s toddler story time is “How to be a Good Dog”. Join Miss Betty in the Children’s Library at 10am for a morning of stories and fun! Local author Deloris Pace will be at the library on July 30th from 12pm-3pm to sign her new book Forged Hearts. We’ll start setting up in Bill Woods Park Friday night at about 8pm with the movie starting at 9pm or as soon as it’s dark enough. Enjoy a free outdoor movie under the stars. Our annual Movies in the Park series kicked off on June 29th with Disney’s Moana (which was rained out twice on us last summer). Our second movie will be July 13th and features a recent Disney Pixar animated film. We added in some new DVD shelving that makes it easier to browse through the titles. The patrons seem to love it with several commenting that they have discovered movies that they didn’t know we had. The library offers Toddler Story Time each Friday at 10a.m. © 2019 Whitley County Public Library News.